A mystery man is being credited for saving the life of a police officer who was involved in a near-fatal automotive accident earlier this month. Officer Carlos Basurto of the San Mateo Police Department in California was driving home from work earlier this week when he dozed off at the wheel, resulting in his car turning off the road and flipping several times. As Basurto was lying in the wreck, he knew that he was in grave danger and he had to stay awake long enough for paramedics to arrive. Luckily, he was soon joined by several good Samaritans who stopped their cars and rushed to help. Basurto asked one of the helpers to tie a tourniquet on his arm to slow the bleeding. He then proceeded to instruct a man on how to tie off his arm as he was still entangled in the wreck. The injured officer had only learned how to perform the life-saving technique himself during a police training course two months previously – and it’s a good thing that he did. When emergency crews arrived on the scene, they managed to extract Basurto from the wreck and rushed him to the hospital. “When he got to the emergency room the operating doctor said whoever placed that tourniquet on his arm saved his life,” Basurto’s brother Alfy wrote in a Facebook post. “[Carlos] had ruptured the major artery in his right arm and would have died at the scene. Though Basurto has undergone multiple surgeries, he still has a long way to go before he can return to a relatively normal state – although Alfy is quick to say that he is just glad his brother is alive. 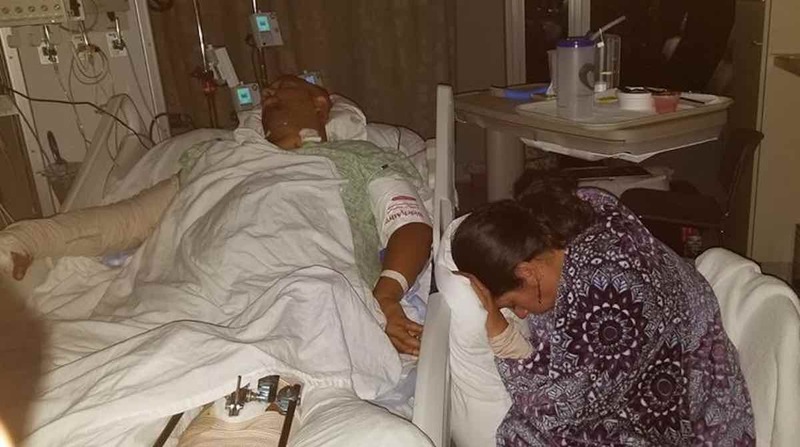 The San Mateo Police Department set up a GoFundMe campaign to care for the Basurto family and offset medical costs. It has already raised $63,000 of their $100,000 goal. Alfy, meanwhile, remains optimistic for the future.